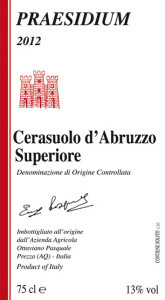 The Cerasuolo Superiore is created with the same grapes as the Riserva, by limiting to a few hours the maceration process with the grape skins. 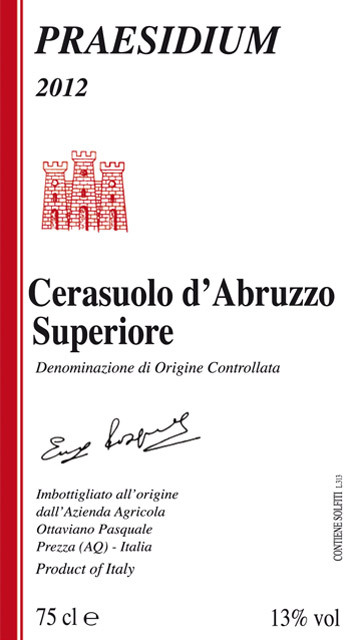 The Cerasuolo Superiore, with its intense pink color, subtle bouquet of sorb, pomegranate, wild roses and its refreshing acidity, is a versatile wine. It’s perfectly coupled with pasta, white meat, salami and even fish. The elders of our town agree that in the past the local traditional wine had these same characteristics. Clayish, very rich with white calcareous stones. Manure, fava bean (or “sovescio”). Occurs usually within the first 15 days of October. Grapes are harvested manually using small 20 kg (44 pounds) baskets to ensure they are not damaged upon arrival to the cellar. The wine is not filtered, neither pasteurized, it only undergoes natural decantation .Sulphites are added in much lower amount than the maximum allowed from the organic certification.